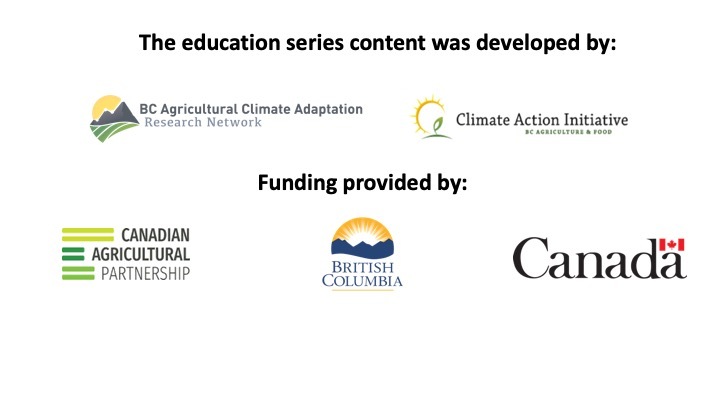 The BC Agriculture and Climate Change Education Series was a four-part event, delivered across 8 educational institutions from February 28th to March 21st, 2019. The series covered key climate change issues in the British Columbia agricultural sector and highlighted current initiatives that support producer adaptation. Below is a list of the educational institutions that took part in this interactive cross-province collaboration. Each module included a broadcasted presentation from a leading expert in the field, an interactive questions period, regional activities that were facilitated by our team of Regional Instructors, and the last module included a regional extension panel session. Key discussion points from each regional activity were shared with all other regions (using a video conferencing system) during a report back session to give participants both a regional and provincial perspective on climate change issues and initiatives in BC. The content developed for this series has been professionally recorded and will be freely available to instructors and professionals that would like to incorporate these materials into courses, training sessions and professional development activities related to agriculture and climate change (videos will be made available in the late Spring 2019). The series was delivered live to 284 individuals across the province were mostly students, with some community members and professionals also in attendance.